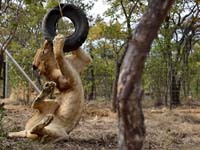 Animal Defenders International : Animal rescues : Tragic News – two of our rescued lions struck down by toxin. It is with great sadness that Emoya Big Cat Sanctuary and Animal Defenders International announce the passing away of Rapunzel (right) and Kala (left), two of our 33 lions rescued from South American circuses. Four lions, Rapunzel, Kala, Coco and Junior in the Colombian pride were struck down by a botulism toxin – this was a naturally occurring toxin, that most lions are resistant too, and if infected are usually successfully treated, however, Kala and Rapunzel appear, for whatever reason from their past (be it genetics and in-breeding, their disease or life history) were especially susceptible. Although we believe all 44 lions at Emoya will have been challenged by the toxin, no others were affected. Symptoms were first spotted with Rapunzel, Kala and Coco and they were rushed to Dr Peter Caldwell’s state of the art veterinary hospital. Then symptoms were noted in Junior Bucaramanga and he was also sent to the hospital. Our veterinary team worked around the clock, with Junior and Coco responding well to treatment but tragically not Kala and Rapunzel. Coco and Junior are returning home from hospital today. We know that the animals we rescue from a lifetime of malnutrition and abuse are always going to be vulnerable, despite our best efforts with food, veterinary treatment and vitamin supplements. Indeed both of Rapunzel’s parents had died in the circus cage with Rapunzel – her father, from a bacterial infection, just weeks before ADI was able to seize her from the circus. 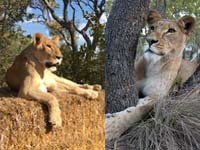 Nevertheless, the death of these lovely lionesses, who loved their new home at Emoya so much, has come as a devastating blow to the whole team. Both lionesses had been rescued by ADI early in Operation Spirit of Freedom, and so had been in our care since 2014. When they arrived, they had been extremely nervous – Rapunzel had been scared to leave her circus cage – but blossomed into playful characters. 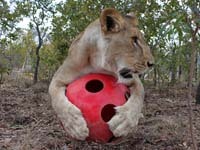 At the ADI Rescue Center in Peru they had loved to chase and play with footballs and our huge homemade catnip toys. The past 20 months were the happiest of their lives. Both took to life at Emoya with the most inspiring enthusiasm – they would joyfully run, play with catnip bags and swing their tires from trees, which makes this news so very sad. We treasure every minute of happiness we have given the lions at Emoya and every day of freedom is precious for them, even if for now, we are all heartbroken that their days in the sun were so few.